I mean, who can resist a chewy granola bar? Looking for a fabulous on-the-go breakfast or snack? 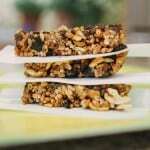 These granola bars are just the thing! Watch the video below for step-by-step instructions for my No-Bake Chewy Granola Bars. In just a few minutes, you’ll have homemade granola bars that are healthier than most store bought varieties for a fraction of the price. You can use your favorite mix-ins and your favorite granola too. I used Bakery on Main Apple Raisin Walnut Granola for this recipe, but I’ve used homemade granola or other brands with equal success. In a medium saucepan, combine the brown sugar, honey, and coconut oil. Bring the mixture to a boil over medium-high heat, then lower the heat to medium-low and simmer until the sugar dissolves, about 2 minutes. Remove the saucepan from the heat. Add the granola, rice cereal, and raisins to the saucepan and fold the ingredients to evenly coat with the sauce. 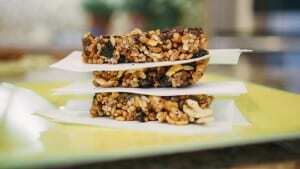 Transfer the granola mixture to a 9-by-13-inch ungreased baking pan and press firmly to evenly fill. Gently press the chocolate chips onto the top of the granola. Let the granola mixture set in the refrigerator until firm, about 15 minutes. Then, cut into bars or squares. This entry was posted in Appetizers & Snacks, Recipes and tagged dairy free, dairy free snacks, g-free diet, G-Free Foodie, gluten free, gluten free cooking, gluten free diet, gluten free parent, gluten free snacks, granola bars, kc cornwell. Bookmark the permalink.